AFP - Australia Thursday tightened its sanctions on Iran in a fresh bid to convince Tehran to allay international concerns over its nuclear drive. Wall Street Journal Europe - Solana, Straw, Fischer, and de Villepin have a lot to answer for since their policy bought Tehran crucial time. 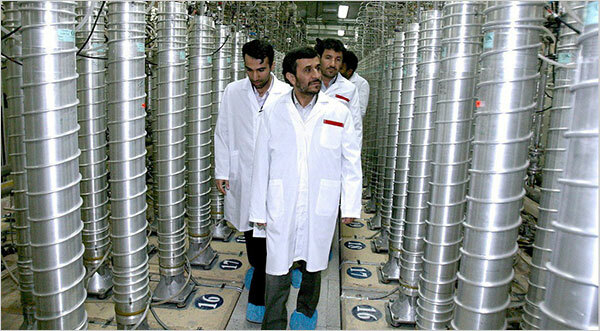 Iran's President Mahmoud Ahmadinejad boasted last week that the regime would install 60,000 new, "third-generation" centrifuges to enrich uranium. As world leaders met in Washington this week to discuss how to prevent nuclear terrorism, there was little doubt that time is running out to deal with Iran's nuclear weapons threat. AP - OTTAWA  Iran's nuclear program is of "critical concern" and will top the agenda when foreign ministers from the Group of Eight nations meet Monday to discuss global security, Canada's foreign minister said. LONDON (Reuters) - The Conservatives, favourites to win an election due in weeks, said on Wednesday they would back a U.N. arms embargo on Iran and a ban on oil and gas investment if Tehran remains defiant over its nuclear plans. In the Iranian desert, at a sprawling industrial site ringed by barbed wire and antiaircraft guns, a shift in the enrichment of uranium is producing global jitters because it could shorten Irans path to the acquisition of nuclear weapons.